Divine Touches of Master: What is Karma? The word karma is well known to everyone. Everyone frequently uses this word too in daily lives but seldom give importance to the real meaning of it. Karma is often referred to something bad. Karma is actually the deed or act that one commits in thoughts, words or action. It is both the good and bad act, both negative and positive deeds that one commits. Any positive deed or act is referred to as good karma and any negative deed or act is referred to as bad karma. Once the act is committed you reap its results also. For any negative karma, you bear the consequences in life negatively (suffering, pain, disease, obstacles, etc) and for all positive karmas you reap its consequences positively (health, wealth, success, peace, happiness, etc). Karma has been described in all religion in different ways. I being a Christian by birth grew up listening to the words from bible, "As you sow, so shall you reap) The basic fundamentals of any religion is to do good, thus to reap good. All religions preach to avoid bad things in life or face the negative consequences. I have always learnt as I grew of being punished. I saw that everywhere in society too. Even in my own home, when I did wrong I was punished by parents, teachers, etc. I was always told that God would punish if I did anything bad. This created a constant fear in me of not doing bad so that I am not punished by God, and if not God at least not punished by people. This fear exists in society too. But what I have learnt through experience and through babaji is that everything is bhaav. It is purely your intent that creates that karmic good or bad label. It is your own interpretation of how you take things. It is your own guilt which binds you with a negative karma which could have been just a positive karma by changing the intent of it. Pure intent comes out of unconditional love and a goodwill for all without any selfish motives. Everything thing that you have done in all life times, are doing, and are going to do all keep creating psychic impressions which is known as samskara. Everything that you think you act upon or to simply put it, everything that you do is a result of what you have thought which means every action originates in the mind. These thoughts create samskaras (impressions) and the actions that you do under it's influence further engraves those impressions even stronger. The more stronger these impressions become the more inclinations towards doing that act. That act creates a Karma. So it is also important to note how these psychic impressions make us do karma. This can be clearly seen with habits, cravings, etc. Habits are nothing but strong psychic impressions that has become strong after repeated acts. Noone becomes a smoker by smoking the first cigarette. It is the repeated act that creates that habit. That habit makes one act. That act is Karma. I hope I could put this clear. So, it is also important to be careful of not creating newer negative impressions for it can lead to this vicious cycle of cause and effect. As humanity developed karma was given its own terms and conditions and own interpretations. Now, to go a little deeper, just the act or deed that would look positive or negative does not determine whether it is good or bad karma. What is important here is the intention behind the act or deed. For example, saying a lie is termed as a negative act in society and even the scriptures and religions have preached and practiced it. Babaji and bade baba (Baba Nithyanand of Ganeshpuri, who is the guru of babaji) always stress on the word "bhaav" They consistently stress that every is bhaav (intent). So, let us say one lies with the pure intention of saving someone's life and lie is not planned or manipulated but a spontaneous one and the intention or motive behind the lie is pure, then it cannot be a bad karma. However, if there is guilt in one's mind that one has sinned, then one can create a bad karma because he created a negative psychic impression. Sanchita Karma: This is the total Karma that you have accumulated throughout all your lifetimes till day. This also mentioned to as the "arrows in the quiver". These arrows are yet to be shot but remain ready to be shot when the time is ripened. These are all the pending arrows that had not been shot in all your past lives and is a carry forward to this life, waiting to be shot one by one. It is important to understand here that you take birth only to release these karmas that are lying pending in your account. So, life goes on till you exhaust all your Sanchit Karmas. 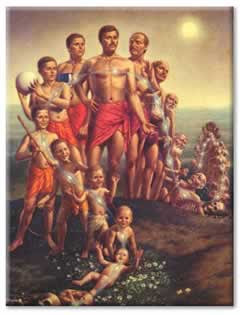 Praarabdha Karma: These are the Karmas that are now set in action or are bearing the fruit. This can be referred to as the arrows in shot from the bow. Now the Sanchita Karma starts bearing results on the form of various influences in human life. This takes place n the form of mishaps, troubles, disease, problems, etc for negative Praarabdha and for positive Praarabdha it results in good health, abundance, peace, success, etc.) Praarabdha is not a punishment but the result of the law of cause and effect (Law of Karma) and only after the praarabdha is experiened that Sanchita Karma pertaining to it is dissolved. Kriyamana Karma: These are the Karmas being processed or being created. This can be referred to as arrows in hand. Kriyamana Karma is the karma that we create in this lifetime with our own freewill that creates instant Karma and they can be cleared off soon also. The fruits of Kriayamana Karma are bore in the current life and some can be stored for bhog in the future births. The one that bears immediate fruit is called as Arabdha Karma and the one that bears in a future now and not immediately is called as Anarabdha Karma. For example: Two persons get involved in violence. Police is able to catch hold of one of them and he experiences the punishment; this is Arabdha. The other person escapes is yet to experience the effect of his Karma in this lifetime or a future lifetime; this is Anarabdha. Aagami Karma: This is the future Karma, the Karma that is being accumulated now and is going to come as a result of good and bad actions done in the current lifetime. If you fail clear off your debts in this lifetime, more of Sanchita Karma will be added. It is like an insurance policy for the future in which clean merits during this lifetime will ensure a better life in the next birth. Karma is such an extensive and intensive subject that it cannot be put up in a page or so, but these are just basics of understanding why you are here and how you are here. How do you clear negative karma? With ShivYog sadhana babaji teaches all saadhaks to help dissolve the Sanchit Karmas that are creating problems and obstacles in the current life. 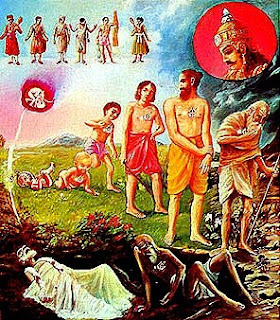 Babaji dissolves most of the karmas in every sitting in his 9-day shivirs and also in Prati Prasav Sadhana (Past life). The rest the saadhak has to work out by doing regular sadhana which involves chanting, selfless service, unconditional love, forgiveness and sending healing to the self and others. ShivYog sadhana reduces the impact of Prarabdha bhog, dissolves the Sanchit karma before it affecting you, and also prevents you from creating further negative karmas. After a Shivir you will notice the lightness in your life and changes start occurring soon after. With individual sadhana slowly life starts moving to how you like it to be. Read other articles here to understand more about the courses or about ShivYog sadhana. If you have not attended any Shivirs or are not a ShivYog saadhak, please listen to Babaji's valuable discourses, where things would become crystal clear and help you live your life to the full with 100% bhog (materialistic) and 100% moksha (spiritualistic). There are CDs available in Divine Shop at all Shivirs and ShivYog activities. You can buy it from there or you can order it. Since the money towards the contribution of any shivir or CDs or materials goes towards noble causes, I don't want to be distributing anything free of cost online and one should not do so too. Nothing in nature is free, you always have to give something in order to receive, be it love, money, knowledge, etc. The theory of Karma has Babaji's discourses in 15 parts of 30 mins each in which Babaji has so beautifully explained it with so many examples of the Theory of Karma. You can download and listen to the first two parts here. However, shortly I will be giving free links to download all of Babaji's pravachans (discourses) that are otherwise telecasted on TV. Hope, you soon begin your new journey towards liberating yourself from the clutches of Maya (illusion) and Karma and move towards the ultimate goal of self-realization. would u also upload the other part of theory of karma?